Before getting lost in themes and design elements, first take a moment to think strategically about what your site should do to accomplish your business goals. This will help as you evaluate the numerous themes available. Jetpack includes hundreds of professional WordPress themes. More than 150 are available for free, while a Jetpack Professional plan includes over 200 more premium WordPress themes. These themes are suited for any kind of site, from startups to large businesses. Whether you’re working with a designer or building the site yourself, Jetpack offers professionally built themes that will help you get started immediately. To choose the right theme, ask yourself a few questions. How should your site look and feel? What types of content will you feature? Whatever your goals, the Jetpack theme gallery lets you use keywords to search for the type of site you want. For example, if you are building a food blog, keywords such as “food”, “drink”, or “recipe” will help you find themes suitable for your content. You can also search through the showcase by theme name (eg: “Confit”), feature (like “sidebar”), color (try “green”), or site type (eg: “restaurant” or “portfolio”). Let’s dig into a few examples of specific features you may want to look for when picking your theme. Features to consider for a food blog might include space for large photos, recipe cards, related recipes, a photo gallery of recipes, cooking demonstration videos, contact points for your visitors to interact with you, ways for visitors to share your content, email subscription so that you can send additional useful information and stay in touch, and ads or ad links for related products and ingredients. If you’re building an ecommerce site, consider product galleries, promotional links for related products, shopping cart, payment functionality, wishlists to save items, order history, product description pages, customer service resources, and forms of support (like live chat or contact forms). For an online training resource, consider instructional articles with images, video tutorials, related articles, training materials available for free or purchase, webinars, ads, a calendar of upcoming courses, and a searchable gallery of existing content. For a news site, consider featuring new content on the home page, organizing topics visually into categories, featuring related articles, ads, and ways for readers to interact with the authors and share content with social networks. For a physical store, consider product information, store locator, location details, hours, contact info, inventory search, online orders or reservations, subscriptions for special offers, and customer service. For a restaurant, this might include menus, location, hours of operation, and special events. Pick a theme. Try it out. Customize it. Change your mind. Pick another theme. With WordPress and Jetpack, it’s easy to experiment until you find the design that’s right for you. Jetpack provides image and video acceleration services for WordPress sites. That means a reduced load on your host, and faster content for your readers. Not only does Jetpack reduce the time it takes images to load on your site by hosting them on its own servers, but it also keeps your site fast by only loading those images when they’re visible on the visitor’s screen. If your page has 20 large photos, it could take a minute or two to fully load without Jetpack. With Jetpack, however, the combination of our content delivery network and lazy loading images features will allow it to load almost instantly. All Jetpack plans include free unlimited image caching and lazy image loading. You can also add video hosting – unlimited with the Premium and Professional plans – which is ad-free, watermark-free, and does not consume space or load time on your host’s servers. This is an excellent option if you’re posting things like tutorials, webinars, video product reviews, news clips, cooking demonstrations, or travel footage. Adding content and maintaining an active web presence helps to keep your site relevant to readers, whether you’re blogging about food, featuring products on your ecommerce site, providing up-to-date training materials, or sharing current events. Jetpack can save you time by streamlining the process of adding content to your website. Tiled Galleries lets you quickly and attractively display galleries of images. This could be a gallery of images from the recipes on your food blog or photos of your adventures on a travel blog. Carousels make your images display full-page for a stunning, professional-looking slideshow of your galleries. Markdown allows you to quickly write your content with basic formatting codes, so you can keep typing without having to stop to click formatting options or write formatting codes. It also gives you the ability to proofread quickly without the distraction of HTML. Proofreading ensures your spelling and grammar are accurate, and that your content represents you in a professional way. Shortcode Embeds allow you immediately embed a video, audio, images, documents, and more from a variety of sources right into your posts. This includes video from YouTube, Vimeo, Dailymotion, Hulu, Ustream, TED Talks, and more. There are shortcodes to embed documents and presentations, such as Google Documents and Slideshare slideshows. One practical example: for a food blog, you might want to use the recipe shortcode to standardize the format of the recipes both for consistent on-screen display and printing. If you’re promoting a physical store or restaurant, there’s also a shortcode for Google Maps to display the location. Choose a theme and customize it. Turn on Jetpack’s image CDN and lazy loading images option. Enable tiled galleries, carousels, and content embeds. Upgrade to Jetpack Premium to post videos. Upgrade to Professional to access unlimited themes. With your design and content in place, you’ll want to make sure your site, your data, and your customers’ data is safe. With Jetpack, this is a “set in and forget it” set of tasks. Jetpack includes many tools that help you keep out intruders, and be alerted quickly about any issues with your site. Basic security features work automatically when you install Jetpack, protecting you from attacks immediately. Jetpack’s downtime monitoring service sends you immediate notifications if your site goes down, 24/7. This lets you find and fix problems faster, plus gives you insights on the reliability of your hosting long-term. This also saves you the embarrassment and costly downtime of waiting until a visitor tells you that your site is down… and who knows how long that might take. Jetpack protects you against traditional and distributed brute force attacks that use many servers against your site. With botnet protection in place via Jetpack Protect, your site will block all unwanted login attempts. Spam filtering keeps your site looking professional and trustworthy by automatically filtering out untrustworthy comments, pingbacks, and contact form submissions. This service also lets you review comments flagged as spam, and view stats about the current and previous spam activity on your site. Two-factor authentication through your WordPress.com account is another way to keep your site secure. This means that if you’re managing your site through the dashboard at WordPress.com, your login requests will go through a secure HTTPS connection. Public wifi? No problem, Jetpack’s got you covered! Jetpack also lets you manage all your plugins from one or multiple sites on a single dashboard. You can set plugin updates to happen automatically for one or more sites, reducing the potential for security issues that can arise from out-of-date software. Malware can take the form of plugins, themes, and other scripts that pretend to be legitimate products. It contains code behind the scenes that steals or deletes your data, modifies your links to steal your traffic, or simply breaks your site. Both our Premium and Professional plans provide daily malware scans, and will alert you if anything is found that needs to be removed. Every site should be backed up to avoid costly headaches that result from mistakes, server outages, and hacking. With any of Jetpack’s paid plans, just enable backups and your data will be backed up automatically and in real-time. With your backups in place, it only takes one click to restore your site to a previous version. Talk about peace of mind! With paid plans starting at just a few dollars a month, there’s no reason to risk losing your website data. Jetpack also provides you with a detailed record of your site’s activity so you can view you site history, track down problematic changes, and quickly “undo” them by restoring a previous backup. With Jetpack, you’ll always know what’s happening on your site, and be able to quickly recover from any mistakes. Autopilot is great… until you run into something unexpected. At that point you’ll need help from an expert. Most people end up paying loads of unnecessary fees to developers to fix their problems. Jetpack removes this headache — and cost — because all paying customers are entitled to fast, expert, and priority support from our global team of WordPress security experts. Enable brute force attack protection. Get familiar with your site’s activity. Set plugins to auto-update themselves. Upgrade to Personal for real-time backups and priority support. Upgrade to Premium for malware scanning. So now you’ve got a theme and content. It’s time to engage with your audience and get people looking at your site! Jetpack helps you spread the word — and streamlines that process to save you valuable time. A few minutes of prep work will help you make the most of the content you create and set the stage for a successful site. Most of Jetpack’s marketing automation tools require no configuration, and the ones that do are 100% code-free. Measuring the effectiveness of your site and its content is essential. When you know what’s succeeding, you can do more of what works. Jetpack’s site stats provide you simple and concise insights about your traffic, what content is receiving the most visits, and where your visitors are coming from. These stats are also designed to work on mobile devices, and integrate fully with the official WordPress mobile apps. Subscriptions let people sign up to hear from you via email. Any time you post a new piece of content, subscribers will receive it in their inbox. This is a good way to make sure your content gets to the people who care about what you have to say. You can add Jetpack’s Subscriptions feature to your site in a variety of ways, including a subscriptions widget or with a custom subscriptions page. Sharing makes it easy for your visitors and readers to share your content with their social networks, like Facebook and Twitter. This gives you a broader reach than your own set of followers. Reach your followers’ followers and beyond! Turning on Jetpack’s sharing tools automatically displays sharing buttons below your posts and pages so that your fans can share your content anywhere they like. Jetpack replaces the default comment form with a new comment system that has integrated social media login options. This makes it easy for your audience to communicate with you simply by logging into their choice of social accounts. 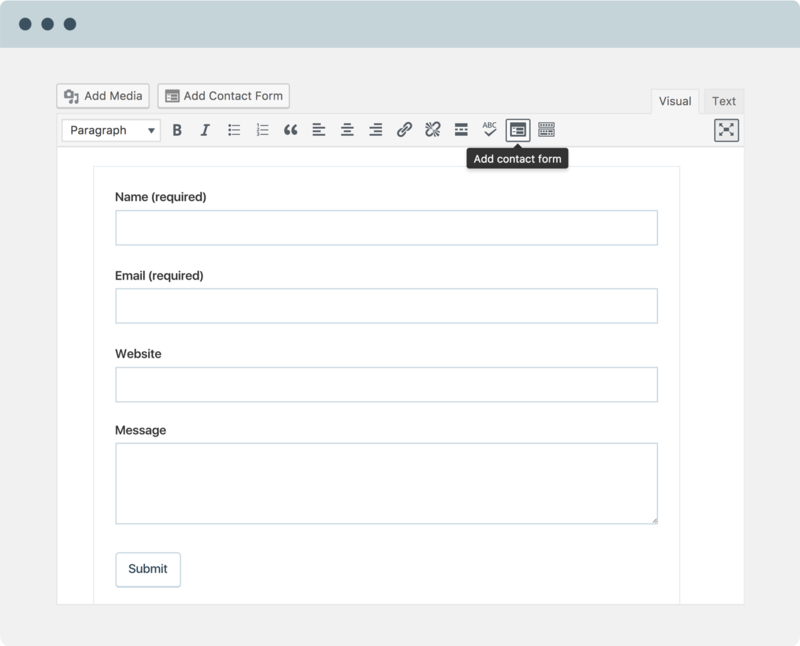 Jetpack’s contact form makes it easy for visitors to contact you without giving out your personal email address. Customizing the fields on this form lets you choose which information you want to collect. You can ask visitors for delivery dates, birthdays, the best day to contact them, or anything else you can think of. Upon submission of the contact form (which goes directly to your email), you can let a visitor know the message has been sent, or even redirect them to another page showing them a custom message or special offer. Once you’ve laid the groundwork for your site, enable and configure the following features and services to streamline and automate repetitive tasks, allowing you to focus on what really matters to you. 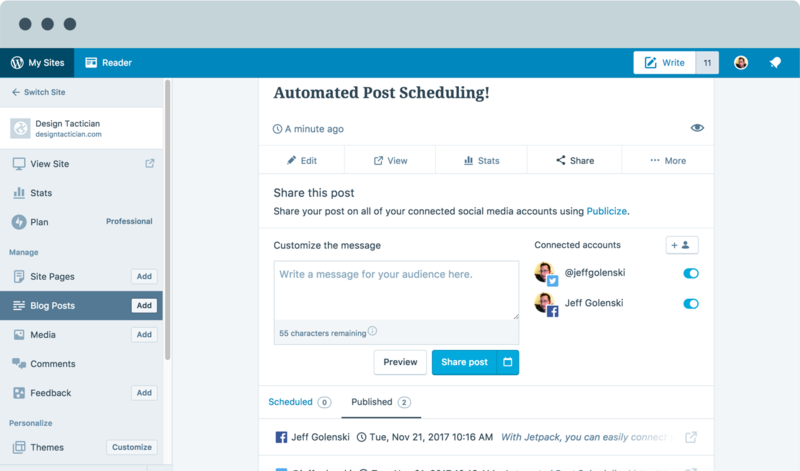 Jetpack’s Publicize feature automatically notifies all the networks you’ve selected and provides links to your site as soon as you click “publish” on a post, making it much less time-consuming to share your newest content. You can customize the text included with your shares, and and toggle specified social networks on or off. Both Premium and Professional plans allow you to schedule shares or re-shares of your content for specific dates and times in the future. Get your content noticed by search engines with our SEO tools. All Jetpack plans include sitemaps, and the Premium and Professional plans also provide the ability to preview content as it appears in search engines, plus a Google Analytics integration. Jetpack hosts a powerful infrastructure powered by Elasticsearch that indexes your site’s content and creates meaningful links between your posts and pages. It’s much faster than the built-in WordPress search, especially if your site has a lot of content or products. Jetpack’s related content service will automatically display other related posts from your site at the bottom of your posts and pages. This means that if a visitor is interested in your site, there is a good chance you can keep them around for longer. Whether you are looking to sell products on your website, collect donations for a cause, or just cover some maintenance costs, Jetpack can help you generate revenue without a ton of work. Our ads are a one-click feature designed to help you generate income from your WordPress site. We provide more than just high-quality ads: we’ve also determined the best placements to guarantee the highest revenue and most reliable compatibility across most WordPress themes. Ads are available to anyone with a Premium or Professional plan. There’s no approval process required, and you can customize their appearance on your site in several ways. Our Simple Payment Button allows you to accept PayPal payments for physical products, digital goods, or donations by placing one or more buttons on your site. This is a handy option for collecting payments available with a Premium or Professional plan. If you’re looking for more advanced ecommerce tools, check out WooCommerce, which allows you to sell a variety of products including physical and digital goods, memberships, and subscriptions, and to accept payments both online or off. Jetpack also makes it possible to enable WooCommerce Services, which makes core eCommerce features (such as shipping and tax rates) more reliable by taking the burden off your site and hosting them with our best-in-class infrastructure. That means your store is faster and more stable. Configure Publicize for automatic social sharing. Upgrade to Premium for ads, social re-sharing, and simple payments. Upgrade to Professional for Elasticsearch. Whether you’re building a food blog, ecommerce site, online training resource, news site, web presence for a physical store, or whatever else you can imagine, Jetpack has everything you need to make your site successful. Or contact us! We’re happy to help, and priority support is included for all paid Jetpack plans. You can also read our guide to choosing the best plan for your site.